Lotto Madness Video Slot Guide & Review - Casino Answers! Lotto Madness is a 5-reel, 20-line video slot developed by Playtech, featuring a wild symbol, scatter payouts, a free spins feature with multipliers, a bonus game and a progressive jackpot. You can play the Lotto Madness video slot game at Bet365 Casino and Omni Casino. Lotto Madness is not a lottery game, but rather a slot game with a lottery theme. Symbols on the Lotto Madness video slot include the Wildcard (wild symbol), Dollar Sign (scatter symbol), Bonus Wheel (bonus symbol), Stacks of Dollar Bills, Champagne, Lottery Winner and Lottery Balls (from 6 to 10). The progressive jackpot on the Lotto Madness slot is also a lottery game. Enable the Dollar Ball mode to play for the Lotto Madness Dollar Ball Progressive Jackpot. The Dollar Ball lottery costs $1 per game. You will have 5 numbers out of 49 to choose from. If all five numbers match, you will win the Lotto Madness Dollar Ball progressive jackpot lottery. You will also receive prizes if you match as few as one number. The Dollar Ball feature cannot be activated in practice mode. You can win this progressive jackpot now at Bet365 Casino! The highest paying symbol on the Lotto Madness slot machine is the Wild Card symbol. To win the 10,000 coin top fixed jackpot on Lotto Madness, you must have 5 Wild Card symbols on a selected payline. The Wild Card symbol counts as any other symbol in the game in order to complete a winning combination (scatter and bonus symbols excluded). Lotto Madness’ scatter symbol is the Dollar Sign symbol. It will pay out 5X your total bet for 3 symbols, 10X for 4 symbols and 50X for 5 symbols. Scatter payouts are multiplied by the total bet and added to payline wins. If the Bonus Wheel bonus symbol appears on the first and fifth reels at the same time in Lotto Madness, you will trigger the Lotto Madness Crazy Wheel bonus game. 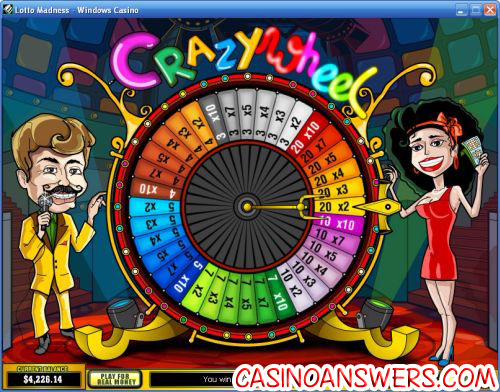 In the game, you must spin the wheel to win up to 20 free spins with a 10X multiplier. Once the wheel lands, the free spins feature will begin. The Crazy Wheel bonus game can lead to some big time wins when playing Lotto Madness at Bet365 Casino! The Lotto Madness autoplay mode is located under “Menu.” You have the option of using the Simple Mode where you only have to select the number of spins or you can use the arrows on the left side to expand the autoplay feature into the Advanced Mode. You can set the stop settings of: Jackpot win, single win more than (up to $99,999), overall Win more than (up to $999,999) and overall loss more than (up to $999,999). You can also set the delay between spins to speed up the autoplay. Autoplay can be cancelled at any time by using the “X” button. Only the highest win is paid per line. Winning combinations must be left to right (except scatter symbols). Line payouts are multiplied by the line bet. It doesn’t take a genius to realize that there is a large crossover between lottery players and slots players. Playtech has taken an obvious crossover concept and added lots of fun to it with some great graphics, amazing sound effects and type of top-notch presentation you expect from Playtech. To play the Lotto Madness video slot, sign up and deposit now at Bet365 Casino! Are players based in the United States able to play Lotto Madness for real money? 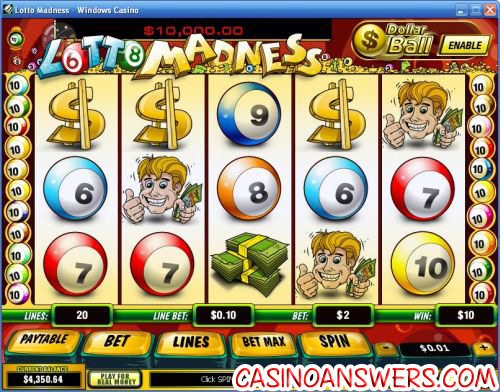 Unfortunately, USA casino players are unable to play Lotto Madness at Playtech casinos at this time. For a fun video slot that you can play at US-friendly casinos, please read our Reel of Fortune Video Slot Review or play it now at Vegas Days Casino. Where can I play a Flash game of Lotto Madness for free? You can play an Instant Play Flash game version of Lotto Madness for real or real money at both Bet365 Flash Casino and Omni Flash Casino. This is the best solution for Mac players looking to play the Lotto Madness slot machine. If you experience any issues with the Flash game, try installing the latest version of Adobe Flash Player. Are there any lottery based slot machine casino games?